Warning! Although the procedures described below have been used successfully by blacksmiths all over the world for centuries, some of the operations involved are potentially very dangerous. Unless you are completely confident in your practical abilities and are prepared to take full responsibility for ensuring your own safety, do not try this at home! I have endeavoured to describe this process as clearly as possible and to point out the dangers where possible but I accept no responsibility for the outcome if you try it yourself. Start with an over-length piece so if you really make a mess of it you can cut the end off and try again. You can anneal (soften) the section you want to work on by heating it to red hot and letting it cool very slowly over a period of several hours. Poking it into a barbeque and then leaving it there while the fire burns itself out is ideal. This will make it a bit easier to work but isn't really necessary. Initially you should try to copy the flute shape and proportions of a good gouge until you know enough to experiment with different shapes. A good basic shape would be somewhere between a U and a V with the bottom of the flute a bit lower than centre. Small tools are easier to make than larger ones at first. I find it best to keep the flute fairly short for several reasons. Firstly the tool is stiffer because more of its length is solid. 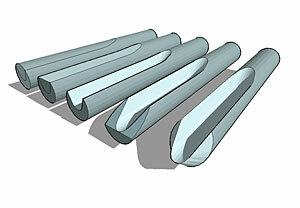 It is safer because only the fluted end is hardened and you are less likely to snap it in use. Lastly a short flute seems to eject shavings better and the stream of chips doesn't hit your hand. You can always lengthen the flute later and perhaps improve on the profile of it when you do. Start by drawing lines on with a felt tip pen to indicate the top edges of the flute. Flatten the top with an angle grinder down to the two lines. Start cutting the flute from the tip (which is still expendable). You can use a cutting disc first to make a slot and then switch to a thicker grinding disc to widen it and shape it, but I've done the whole thing with one or the other depending on the size of the flute. It's a messy process, so I've taken to working outside on my driveway with the tool clamped to a stepladder. Use a protective face-shield so you can get in really close to see what's happening. Beware of the spark stream, I set myself alight once. Stop often and use a felt tip pen to highlight spots that need more work or that are complete and mustn't go any deeper. I find it easiest to do a short section at a time and get it perfect before going further up the length. I hang onto my old angle grinder disks because some have worn to a profile that works well for this purpose. It's good to try to work in both directions while shaping the flute, but absolute symmetry isn't essential. There could even be advantages to an asymmetrical flute, who knows? It's important to avoid grooves or ridges in the profile of the flute because these will appear as notches or points in your cutting edge. You will need to grind at least 0.5mm of steel off the inside of the flute after hardening, so don't go too deep, particularly on small tools. When you're happy with the flute you can grind off some of the tip to begin forming the bevel but don't sharpen it too much yet or the thin edge will overheat during hardening. For this next bit it might be helpful to refer to that table of temperatures and colours again. Hold the tool with tongs or wrap some heavy wire around it so you can hold it completely submerged in the quench medium while agitating it. For small tools up to about 8 or 10mm dia you can try heating with a plumber's butane blowtorch, but for larger tools you will probably need an oxyacetylene torch to provide sufficient heat. You might even be able to approach your local exhaust repair shop and use their torch. If that's not available you could try rigging up some sort of blower into a charcoal barbeque to form a makeshift forge. Heat the fluted section slowly to red, applying the heat from underneath to avoid overheating the thin top edges of the flute. Test it with a magnet as soon as it begins to glow, and test frequently when you think you are close. When the magnet doesn't stick you are at around 800 degrees, note the colour. Remember that "cherry red" looks different in different light conditions. You can go about 50 degrees more to be safe, but hotter than that isn't a good idea. Keep it at that temperature for a minute or two trying to keep the whole thing an even colour. It's not necessary to harden further back than the flute itself. Bear in mind that the magnet only gives you an accurate indication while the temperature of the tool is rising. If you accidentally overheat it and then test it while it is cooling you don't get the same result. Remember too that too much heat will ruin your magnet, so don't leave it in contact with the heated metal for too long. Now plunge it quickly into a large container of water or oil and agitate it vigorously (waggling it is apparently better than stirring it), trying to cool the whole thing as quickly (in less than a second) and as evenly as possible. Uneven cooling will cause warping and slow cooling will cause hardness problems. The red-hot steel tends to boil the liquid around it, forming a barrier of vapour which inhibits further cooling. The agitation is necessary to get more liquid in contact with the metal. Water is easy and clean but it can cause cracks to appear particularly in larger tools. Oil (such as old motor oil) works, but it's messy, smelly and has a nasty habit of bursting into flame unless the tool is completely submerged when you quench it. This is where the heavy wire handle is useful. If you use oil, work outside and be prepared for a fire anyway. If you buy the steel for the tool the manufacturer should tell you what liquid to use for quenching. Some refinements to the process are to add about 8 or 9% salt to the water to raise it's boiling point, or to pour a 4cm layer of oil onto the water so the tool passes through the oil first. Warming the oil to about 60 degrees apparently helps because it thins it and you get better contact with the metal. The exact hardness you obtain depends on the actual steel, but it will be somewhere around 64 - 66 Rockwell C. As it is it's pretty useless, the edge will be brittle and will blunt quickly. You can test it for hardness by filing it or punching it carefully with a cold chisel. Try it at the tip and further back on the shaft. Your fluted section should be a lot harder than the file or cold chisel and certainly much harder than the raw material. After hardening the fluted section will be a dull black. Polish the outside to a bright silver with a strip of sandpaper. Now you need to grind away the surface metal inside the flute because it lost some carbon during the heating process and you need to get to good fresh steel about 0.5mm deeper. If it was heated in a charcoal fire this will be less of a problem, but regrind anyway just to be safe. Grind carefully so as not to overheat the steel. The surface of the flute forms your cutting edge so it's worth trying to get it perfectly smooth and even. Avoid overheating it while you grind, dip it in water often to keep it cool. If you roll up a sheet of water paper and polish the flute your tool will take a better edge and eject shavings better. Once you have it clean and shiny there are 2 ways of tempering the tool. The first method is easiest to control. Simply put the tool in your kitchen oven for an hour at 200 degrees C. When you take it out it should be a uniform pale yellow colour and its hardness should now be about 61 or 62 Rockwell C, but this is not absolute, it varies with the alloy/carbon content of the steel and the accuracy of the oven thermometer. An exact hardness is difficult to achieve without specialist equipment so be prepared to experiment a little. Treat the colours and temperatures as relative to each other for that particular piece of steel. If a tool tempered to very pale yellow doesn't appear to be holding an edge well it could still be too brittle, try tempering it again at a slightly higher temperature to darker yellow. Do remember to remove every last trace of quenching oil from the tool before putting it in your oven. If you don't you'll have to live with the smell for a long time. It's also worth putting a temporary handle on a tool at first so you can test it, or at least hot glue it into the handle so you can get it out if it needs further heat treatment. The second method is quicker but consistent results are difficult to achieve. Heat the tool slowly and gently with a soft flame from a blowtorch along the fluted part, as evenly as possible and avoiding the very tip (which will overheat easily). When the colour changes to a pale yellow and before it goes a darker straw or purple, dunk it quickly in water to stop any further softening. Note that any variations in colour will cause variations in hardness in the finished tool. I prefer to combine both methods, getting a fairly precise hardness in the fluted section with the oven, then softening the rest of the body of the tool a little more with a flame. I would rather my tools bend in use than snap. With an understanding of the tempering process it's easy to see why you can easily ruin a carbon steel tool by overheating it on the grinder while sharpening. The shape of the tool will affect how easily it overheats, smaller, more pointed tools are most vulnerable because there's less steel near the cutting edge to absorb the excess heat. Regular dipping in water will prevent overheating while grinding. If it makes a hissing sound when you dip it, it was already over 100 degrees C and the very edge could be very much hotter. At 250 it is ruined. Temperature, oxidation colour and hardness are all linked. Once the steel at the tip goes dark blue its hardness has dropped to about 50 Rockwell C and rendered it useless. The soft steel must be ground away or the tool can be salvaged by re-hardening and re-tempering. High speed steel is a tool steel that retains its hardness even at very high working temperatures because it has about 6% tungsten added to it. In use it isn't necessarily harder than carbon steel, it just doesn't lose hardness at around 200 deg C like carbon steel does, in fact heating it to around 550 deg has no effect on it. And its transformation temperature isn't 800 degrees either, it's over 1200 degrees. It's simply not feasible to harden and temper it in a home workshop, it requires far higher temperatures, more accurate temperature control and a reducing atmosphere to protect the steel from oxidation during heating. If you really want to make HSS tools it is better to buy the steel, shape it and send it away for hardening by professionals.